On Wednesday 31st January the MFL team welcomed 66 pupils from five of our local primary schools for a masterclass morning. 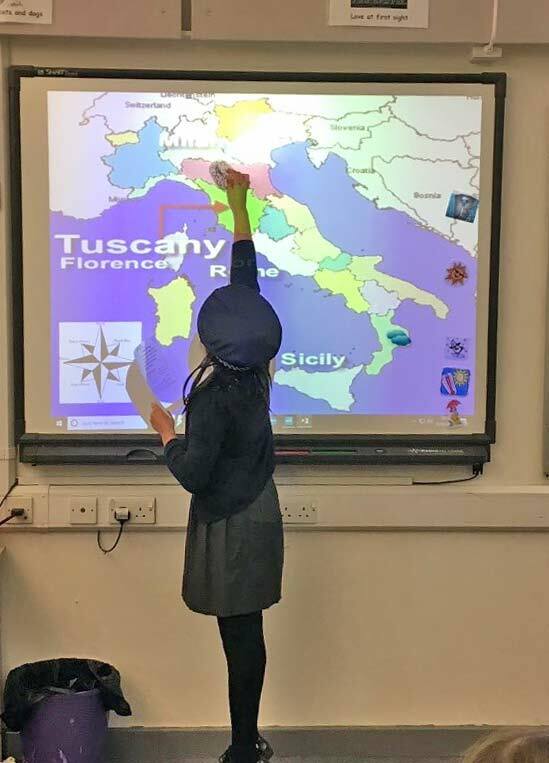 Pupils were treated to two fun and interactive language sessions which gave them an opportunity to see what MFL lessons are like at secondary school. Mrs Dover, Mrs Knight and Mrs Thomas were helped by six Year 9 pupils who did a fantastic job. Miss Williams would like to thank her team, as well as Rory, Milena, Sydney, Bob, Libby and Sophie, for all their hard work. ‘We were helping them with the activities they had to complete. We went round the classroom and made sure they understood what they had to do. When they answered a question we would give them a star to show they did well. Milena had to read out numbers in Spanish so the children could play bingo. We handed out little booklets, pens and colouring pencils and helped them complete the tasks in the booklet. We all sang ‘Old MacDonald had a Farm’ in Spanish and they learnt some of the words for colours, numbers and animals in Spanish. ‘An hour later it was the end of their Spanish lesson so we handed out some juice and biscuits before it was time for them to go to their Italian lesson and another class joined us to do it all over again! We all really enjoyed this and would be happy to do it again’. 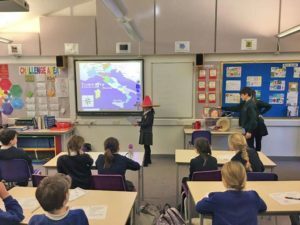 ‘We started off by getting to know the Year 5 pupils and they practised how to say what the weather is in Italian using actions. It was interesting to find out what the younger pupils are capable of. We went round helping them if they needed help and if theywere a little stuck we would tell them to remember the actions we used when we learnt how to say the weather. Then we went on to practise the compass points in Italian and they could make up their own news report about the weather in Italy. They took turns performing their weather forecasts in costumes. ‘After all that happened we brought in some biscuits and squash and they loved it. We did it the second time with the other class and they were just as good as the first half. We would love to do it again’.